The global contract logistics market expanded by 5.0% in real terms (holding exchange rates and price growth constant) in 2017. This was the market’s strongest growth rate in seven years. The strength of the global economy last year was excellent news for the contract logistics market. Put simply, this is because higher economic output is associated with higher consumption and production, which stimulates greater demand for distribution, warehousing and associated value-added services. The IMF estimated that world real GDP growth increased from 3.2% in 2016 to 3.8% in 2017. Further evidence of contract logistics growth can be seen in industrial production and retail sales growth indices. Based on Ti’s research of leading contract logistics providers, the consumer & retail and manufacturing sectors account for similarly high shares of the overall market. OECD figures show that across member states, industrial production growth was 2.9% in 2017, up from 0.1% in 2016. Total retail trade volume growth was 2.5%, up from 2.0%. Geographically, contract logistics growth was broad-based. China’s economy grew at a stronger rate in 2017 than in 2016, reversing the downward trend seen in recent years. Its contract logistics market continues to expand at a double-digit pace in percentage terms. It also grew by more in absolute terms than any other country. The US economy’s expansion continued its upward trajectory that began in late 2016. 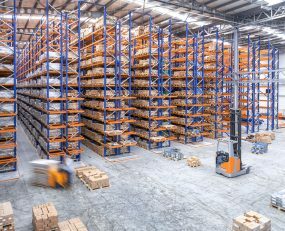 Improved retail sales growth and manufacturing production growth figures also indicated a strong year for the world’s largest contract logistics market. Many of the key threats to the global economy will influence the rate of growth in contract logistics over the next few years. In particular, the increased prevalence of trade protectionism was a fear that surfaced in 2016 but only now is meaningful policy action materialising. Despite this, Ti expects the market to grow at a real compound annual growth rate (CAGR) for 2017-2022 of 5.1%. Rapid growth in Asia Pacific underpins this projection. China’s burgeoning middle class is increasing private consumption levels and providing opportunities to contract logistics providers with a strong presence in the retail sector. Whilst China’s manufacturing base is likely to remain solid, global manufacturers are increasingly looking to South-East Asia where improving infrastructure and lower wages are making them more competitive. This will provide opportunities for 3PLs that specialise in manufacturing in markets such as Vietnam, Indonesia and the Philippines. Asian markets will command a proportionately higher share of the market by 2022 at the expense of developed, slower-growing markets in the West. In general, the pace of expansion in developed markets over the forecast horizon is expected to be marginally lower than in 2017, although there are still high-growth opportunities for 3PLs in sectors such as e-commerce and healthcare/ pharmaceutical. In summary, the global contract logistics market returned to a position of strength in 2017. Providers that can manage upcoming threats and take advantages of new opportunities will gain increased share in a market that will continue to expand at a healthy rate.